In this perspective, I would like lastly to mention another great witness and builder of Christ’s peace, Saint Gregory of Narek, whom I have proclaimed a Doctor of the Church. He could also be defined as a “Doctor of Peace”. Thus he wrote in the extraordinary Book that I like to consider the “spiritual constitution of the Armenian people”: “Remember [Lord,] those of the human race who are our enemies as well, and for their benefit accord them pardon and mercy… Do not destroy those who persecute me, but reform them; root out the vile ways of this world, and plant the good in me and them” (Book of Lamentations, 83, 1-2). Narek, “profoundly conscious of sharing in every need” (ibid., 3, 2), sought also to identify with the weak and sinners of every time and place in order to intercede on behalf of all (cf. ibid., 31, 3; 32, 1; 47, 2). He became “the intercessor of the whole world” (ibid., 28, 2). This, his universal solidarity with humanity, is a great Christian message of peace, a heartfelt plea of mercy for all. Armenians are present in so many countries of the world; from here, I wish fraternally to embrace everyone. 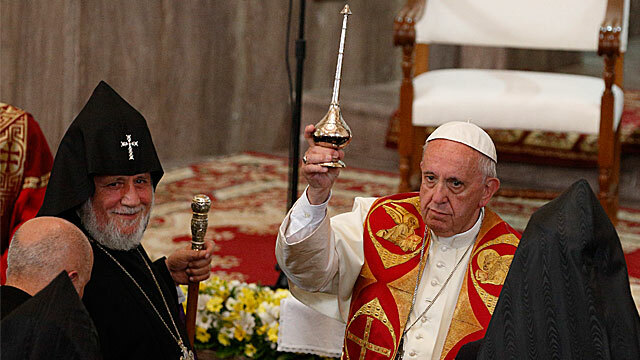 I encourage all of you, everywhere, to give voice to this desire for fellowship, to be “ambassadors of peace” (JOHN PAUL II, Apostolic Letter for the 1700th anniversary of the Baptism of the Armenian People, 7: Insegnamenti XXIV/1 , 278). The whole world needs this message, it needs your presence, it needs your purest witness. Kha’ra’rutiun amenetzun! (Peace to you! ).